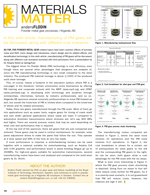 In this sixth article, manufacturing of PM gears will be discussed, along with different cost scenarios. 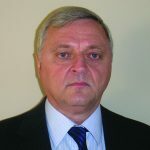 So far, five powder metal gear related topics have been covered: effects of porosity, noise and NVH, micro design and robustness, macro design and its related effects, and densification technology. 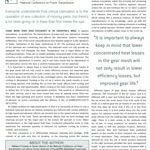 In this sixth article, manufacturing of PM gears will be discussed, along with different cost scenarios borrowed with kind permission from a presentation by Dr. Roland Strehl at Getrag-Ford. 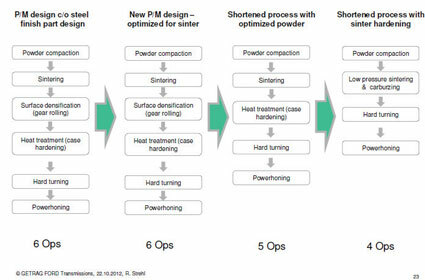 The biggest driver for Powder Metal (PM) technology is cost efficiency, even though there are several other advantages that designers are unaware of, since the PM manufacturing technology is very small compared to the steel industry. The produced PM material tonnage is about 1/1000 of the produced solid steel tonnage. This, of course, leaves a footprint in the education system, where PM is a one-pager in the literature. Certain universities niche themselves by offering PM training and cooperate actively with the MPIF (www.mpif.org) and CPMT (www.cpmtweb.org) in developing both technology and students through scholarships, internships, lectures by industry professionals, and so on. Höganäs AB sponsors several university professorships to move PM forward as well, but overall the know-how of PM is limited when compared to the know-how of steels and its related processes. Today, there are gears manufactured through the PM route. 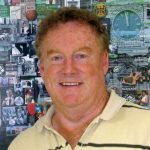 Most of them go into applications such as power tools, engine gears for timing of crank shaft and cam shaft—general applications where loads are lower if compared to automotive drivetrain transmissions where stresses are, let’s say, 800 MPa and higher. There are several process routes that may be used depending on what cost and performance that is required. At the low end of the spectrum, there are gears that are just compacted and sintered. These gears may be used in control mechanisms; for example, solar panel adjustment drives to make the panel that follow the sun. They operate at a slow speed and 99% of the time at very low loads. If more performance is required, a sinterhardening furnace can be used together with a material suitable for sinterhardening, such as Astaloy CrA with 0.6% graphite, and performance levels in plane bending fatigue go up to 350MPa. 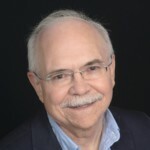 For high-end gears suitable for automotive transmissions, several manufacturing routes have been cost analyzed and compared to the solid steel gears by Dr. Strehl. The manufacturing routes compared are showed in Figure 1, where the steel route involves 10 operations and the PM route involves 4+2 operations. 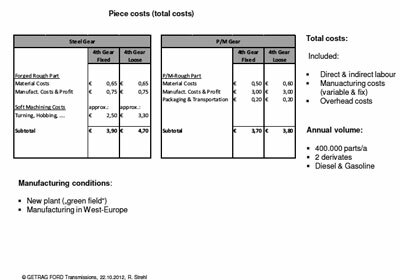 In Figure 2, the cost breakdown is shown for a certain set of prerequisites for steel gears to the left and the corresponding PM gears to the right. As can be seen, both gears show a cost advantage for the PM route with the six steps. 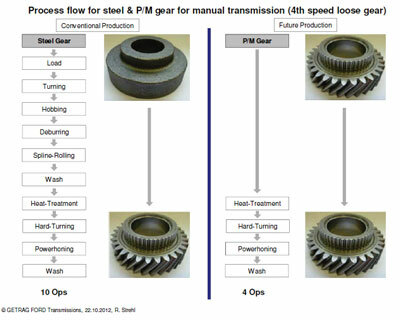 What is even more interesting is Figure 3, where the PM gear process chain shortening is depicted. 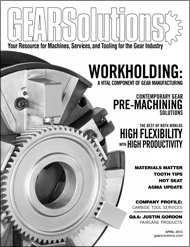 Going from six steps to four will likely reduce costs further for PM gears. As it is a case-by-case scenario, it is not guaranteed that PM will reduce costs. However, the chances are high it will. 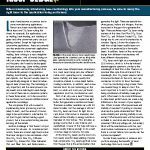 We all know lubrication is critical to the operation of any collection of moving parts, but there’s a lot more going on in there than first meets the eye.